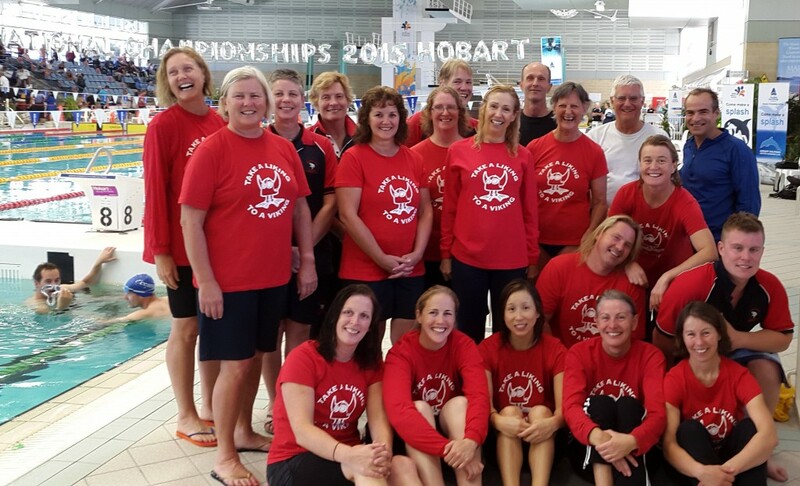 Our team of 20 Vikings were very excited to be heading to Hobart, Tasmania for the 40th Masters Swimming Nationals Championships which were held in Short Course format for the first time since 2009. The Hobart Aquatic Centre was the venue with eight lanes in the competition pool and Hobart proved to be a rather lovely location to travel to, with many swimmers taking the opportunity to do some sightseeing before or after the swimming event and lots of us visiting local attractions around the Hobart area. This year’s Championships certainly had the usual spirit of Masters Swimming with all the elements of fun, friendship and fitness. Our 20 swimmers excelled in the water, producing some spectacularly fast times, smashing PB’s and bringing home medals to the ACT. 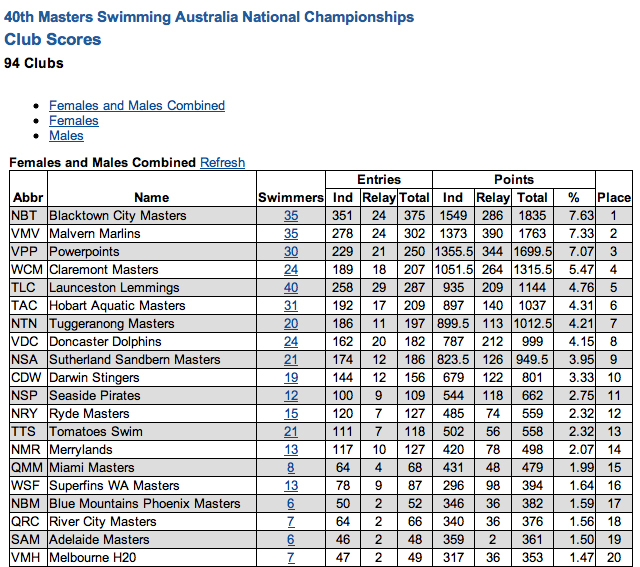 Tuggeranong Masters Swimming ACT is now even more of a force to be reckoned with in the National arena, finishing 6th in the overall point score out of 94 clubs and 2nd out of the NSW clubs behind Blacktown Beavers who had 35 swimmers. Our 15 female swimmers finished 4th overall in the women’s point score and big congratulations to our five male swimmers who managed a fantastic 10th overall in the men’s point score. Some of our swimmers managed to swim a huge number of events, clocking up massive distances of racing with Brenda Day totalling a staggering 2750m, followed by Caz Makin 2450m, Ann Reid 2400m, Anne Smyth 2300m, and Katrina Burgess 2200m. We had 20 superstars in our Vikings Nationals 2015 swim team, and each one of them should be very proud to have been a part of our team! Tom Boyce: The 400m IM – It all came together for that race: execution of the race plan, all the technical challenges of an IM and its pacing, having the feel for the water and the effort, etc. Something about not having any expectations, and being calm and focussed for the race made it actually a pleasure to swim it – just felt better and better as it unfolded. It resulted in a good PB, and more importantly taught me about how to approach a race. Kade Burgess: The 200m Breaststroke and the 100m IM as I felt like I swam well in those swims and achieved the times I wanted. Andreas Falkenau: The anchor leg of the 4×50 Mens Freestyle Relay when I swam a sub 30 seconds, closely followed by my Bronze medal in the 200m Butterfly. Richard Flockhart: The 4 x 50m Mixed Medley Relay. Lizzie led off with her graceful Backstroke and we were in third place. Katrina held on to maintain third against some stiff competition. I then did the 50m Butterfly leg which brought us up to second place. Gary Stutsel finished off with the 50m Freestyle and we came equal first in that heat and on the silver medal overall. Individual swimming was a mixed bag, but seeing that I managed to swim 50m Freestyle three times under 33 seconds was pleasing. I now know where I am at with my swimming and what to strive for. Gary Stutsel: Finishing the last leg of the 4×50 Mixed Medley Relay and looking up at the board to see that we had dead-heated for second place in the 240+ age group! What a team effort. Catherine Alexander: I was unexpectedly amazed at getting two Breaststroke medals. What a boost. My personal challenge of completing a 100m IM was a big achievement for me. Jill Blomeley: I really enjoyed the 200m Freestyle because we had been practising it in training and it felt really good to swim it well! The whole week was great fun! It was great to be able to sit down in between swims and cheer on other team members and catchup. Katrina Burgess: My highlight swimming achievements from 2015 nationals were gaining silver medals in two relay teams and PBs in all my IM races (100m, 200m, 400m). Donna Campbell: My first nationals and a very exciting and rewarding one at that – 4 days, 9 races, 9 PB’s. Taking at least 4 sec off each of my 50m events and testing myself in longer distance events. So glad I was part of a great team. Thanks all for the encouragement and support. Leisa Cass: I went into Nationals hoping for a couple of ok swims and was pleasantly surprised by a fastest in eight years 400m Freestyle and fastest in 10 years 800m Freestyle, along with a fairly quick 50m Freestyle thrown into the mix. But, it was about being there and having fun that made the trip worthwhile. Brenda Day: My day one 800m Freestyle – I was gob smacked and quite unable to explain a PB by 58 seconds – just hope I can repeat in the future. Suzie Gunning: I guess the most memorable moment would be false starting in the 800m Freestyle, feeling like a complete goose and missing my favourite event! My favourite experience was watching team members win medals, especially those who didn’t expect to, and swimming some PB’s myself. Cecelia Kaye: My swims went very well and I had very pleasing times – which tells me that practice really does help! One of my best moments was checking the results for the 100m Breaststroke, then reading it out to my good friend Catherine (who forgot her glasses) – and telling her she swam her way into 3rd place! The look on her face was priceless. My first experience at Nationals was very positive. Be brave and give it a go if you get the chance. Caz Makin: Achieving both my personal goals for 2015 – sub 31 in 50m Freestyle and sub 1:10 in 100m Freestyle! Also my times in the 100m IM and 800m Freestyle on day one were exceptionally rewarding and I was ecstatic to take home 12 PB’s from my own swims plus a silver medal from the last event in the relay simply topped off four massive days in the pool! As Club Captain it was great to see the support and camaraderie between our team members throughout the event – the cheering on of team mates waiting behind the blocks to race was superb to see and hear!!!! Nicolee Martin: I was genuinely surprised by how much I enjoyed all the racing in a 25m (versus 50m) pool, but my favourite swim was the 800m Freestyle in which I felt ‘long & strong’ the whole way (thanks Anne)! Atsuko McGowan: I liked all my swims but my favourite would be 50m Freestyle & 200m Backstroke. Not only did I swim well, but it was great spending time with my swimming friends out of the pool. 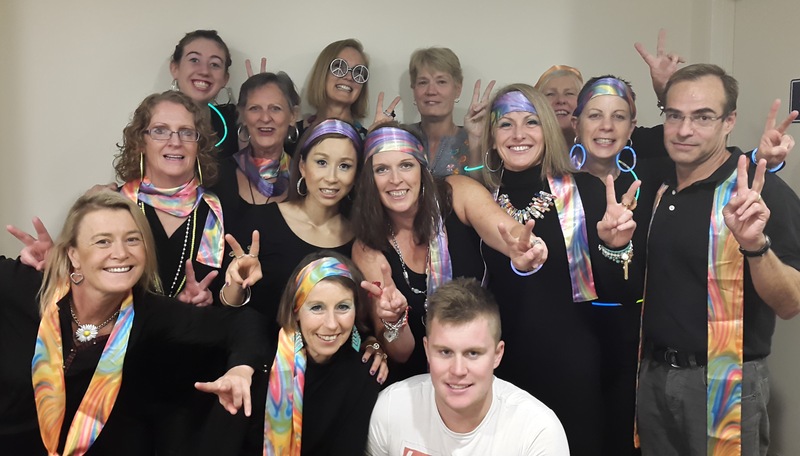 Pam Munday: I was pleased with all of my swims (9 swims: 9 PB’s, 2 state records and 7 medals) but particularly satisfying was my ‘pet’ 200m Breaststroke event when I achieved my goal of ‘swimming it right’. However, I derived most pleasure in watching the achievement of others, especially Catherine’s delight in winning her first National medals and Donna’s massive PB’s in her first Nationals. Liz Needham: Our 240+ Mixed Medley Relay on day two of the meet. I got to swim alongside Katrina, Richard and Gary. It was such a close finish and a tie for second place. Very exciting. Ann Reid: Despite having a cold I swam my fastest 400m IM ever and my second fastest 800m SC Freestyle. 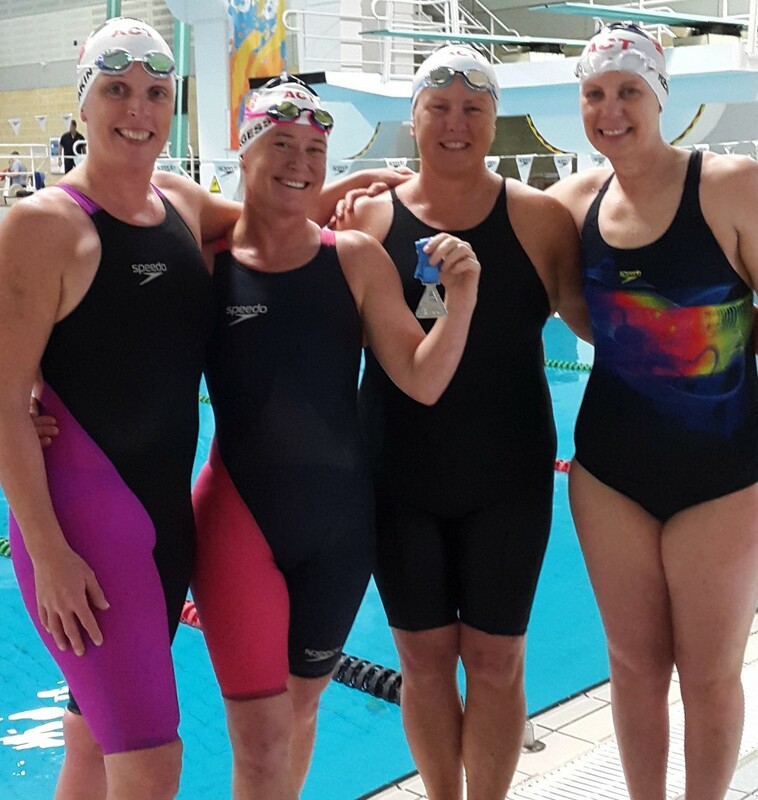 Of course the silver medal from my final event (Women’s Medley Relay with Caz, Katrina and Anne) was the icing on the cake! Lots of people commented on what a great job Sandi did – always good moments for a proud mum! Anne Smyth: The 800m Freestyle – I always enjoy swimming this event and I was amazed to swim so fast and break 11 minutes – something I thought I would never do again. Also as a coach I gained a lot of satisfaction watching team members swimming unbelievably fast times and achieving so many PB’s. What a great four days of racing, camaraderie and fun our Vikings team displayed in Hobart, with our team doing an exceptional job of supporting and encouraging each other along the way, and taking the opportunity to meet new people at marshalling, warm-up and in the stands. … and to top off a great Nationals, we celebrated our Head Coach, Anne Smyth, receiving the award for MSA National Coach of the Year 2014. The 2016 National Championships will be held in Melbourne at MSAC (Albert Park) from 21-24 April, and we hope to have many more Vikings along for the ride! Check out the full results and final club scores.